"Chef Mario Hevia developed this Asian twist on an American classic in a quest to bring together contrasting flavors and textures of sweet and salty, tender and crunchy. And, of course, with gooey cheese on top. 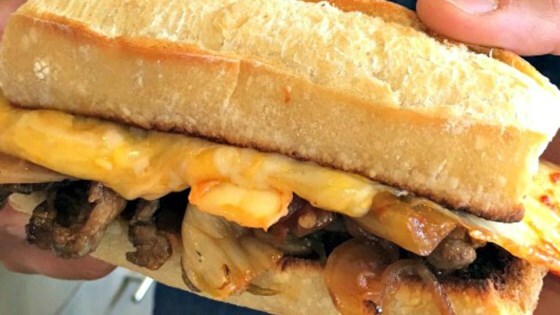 He melts the cheese directly in the pan before laying it on top of the sandwich fillings, making it extra gooey." Mix beef and marinade together in a bowl; set aside to marinate. Heat 1 tablespoon oil in a skillet over medium-high heat; saute onions until lightly golden but still firm, 5 to 10 minutes. Heat 1 tablespoon oil in a separate skillet over medium-high heat; saute jalapeno peppers until very lightly golden, about 5 minutes. Mix jalapeno peppers into onions. Add kimchi and cook until heated through, 2 to 3 minutes. Remove skillet from heat. Heat a separate skillet over medium-high heat and cook steak, stirring constantly, until browned and cooked through, about 5 minutes. Return 3/4 cup kimchi mixture to skillet over medium heat; add 1/4 cup American cheese. Cover skillet and heat until cheese is melted, 2 to 3 minutes. Spread 1 tablespoon mayonnaise onto the bottom half of 1 roll and top with 1/4 of the beef. Layer kimchi-cheese mixture on top of beef and top with roll. Repeat with remaining ingredients to create 3 more sandwiches. Grab a slice of Philly Cheese Steak pizza! Use any variety of cheese in place of the American cheese, if desired. Rib-eye can be used in place of the top round, if desired.